Test pilots at Edwards Air Force Base, Calif., on Wednesday confirmed successful results in a series of tests of a new Sniper pod attached to the forward left side of a B-1B Lancer aircraft, enabling the bomber to do its own targeting. Existing B-1Bs rely on other aircraft and ground stations to positively identify targets. There's still a lot of work to be done though. Maj. Jacque Joffrion, 419th FLTS B-1B flight commander and experimental test pilot, said the aerodynamic interaction between the pod and aircraft is still in question. The worry is that the pod could disrupt air flow, which could screw up the process of separating weapons from the aircraft when the bombs are being dropped. More in-depth weapon separation tests are planned using data from these experiments. Maj. Joshua Lane, the 419th FLTS chief of standardization and evaluation and an experimental test weapon system officer, said the B-1B is an ideal candidate for the Sniper pod because of the bomber's weapons payload -- the largest and most diverse of any U.S. aircraft -- and its extended loitering capability. 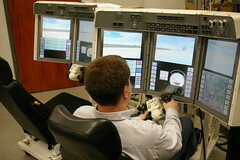 The Sniper pod is manufactured by Lockheed Martin. Not long after 9-11 the Pentagon started issuing broad appeals to researchers, scientists and the public at large for ideas to defeat terrorism. The effort has continued with regular broad agency announcements -- sometimes for ideas in specific capabilities and sometimes just for any ideas they may be kicking around. The Pentagon is now asking Craigslist founder Craig Newmark for tips in fighting terrorism, Newmark told Jon Stewart during a Feb. 26 interview on Comedy Central's The Daily Show. Craigslist is a mostly free online network for classified advertisements in 450 cities worldwide. Stewart: I've heard the Pentagon wants to talk to you, actually, wants to talk about these decentralized sites because they feel like it will give them insights into al Qaeda. Newmark: they're giving us a little too much credit. The deal is that organizations which spread out power among lots of different people they're more resilient. They're more robust. Like if you cut off the head of a centralized organization, they're dead. But if the organization is a network and has a lot of heads, you can't kill it. So there you have it. Craigslist: Purveyor of used bicycles and apartments/Pentagon consultant. U.S. military bomb technicians will be getting some pre-deployment training in crime scene investigations from the Bureau of Alcohol, Tobacco, Firearms and Explosives, the bureau announced Tuesday. Under an expanded program with the Defense Department, an ATF special agent certified explosives specialist will join the staff of the military's Joint Improvised Explosive Device Defeat Organization Joint Center of Excellence at Ft. Irwin, Calif. The agent will train military bomb techs in post-blast investigations and homemade explosives. The program was launched last year in a memorandum of agreement between the two agencies. Part of the special agent's job will be to instruct military investigators about ATF's role in an interagency organization that investigates bombings in Iraq. That organization, dubbed the Combined Explosives Exploitation Cell, or CEXC, analyzes IED debris found at blast sites and sends IED components back to the Justice Department's Terrorist Explosive Device Analytical Center in the United States for further analysis. The program also calls for ATF to train six classes of military bomb technicians this year at its National Center for Explosives Training and Research at Ft. A.P. Hill, Va., and elsewhere. ATF is also developing a course on homemade explosives, which have plagued the American military operation in Iraq since the war began. Defense Secretary Robert Gates told the Senate Appropriations Committee the same day that IEDs are responsible for 70 percent of U.S. military deaths in Iraq. Gates said no matter how many methods or technologies the U.S. military develops to thwart these attacks, the enemy always finds a way around them. 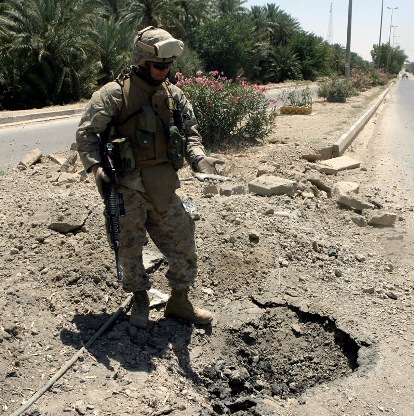 DOD is asking Congress for $2.4 billion to fund research into technologies to counter roadside bombs. ATF has also trained Iraqi police officers in explosives disposal and investigation and provides data on IED incidents to DFuze, an international and multilingual database about bomb and arson incidents throughout the world. Crime scene investigation has become an interesting and challenging new mission for the military as it attempts to reverse the escalating trend in violence in Baghdad. I hinted at the military's new CSI function in The Cutting Edge column of the March issue of DTI, which referred to the Defense Department's Automated Biometric Identification System, or ABIS. ABIS is a database of biometric data collected in the war on terrorism, and includes, for example, fingerprints from the remnants of improvised explosive devices in Iraq. The item in The Cutting Edge was about how the U.S. Navy is testing handheld biometrics kits to screen sailors on commercial vessels against these fingerprint databases. The kits were acquired through DOD's Biometrics Task Force and are backpackable for easy use during at-sea interdictions. "I’d say we’ve done a reasonable job off managing the balance between risk and reward – reward being the ultimate performance of the system," said Dr. Thomas Killion, the Army's chief scientist, of Future Combat Systems during a January interview in his Pentagon office. "And we’re very cognizant of the risk associated with the various systems." What a lot of people would like us to do is manage it as piece-parts, essentially like traditional acquisition programs: platform X, platform Y and so on, each one managed as a separate program. Personally, I think that that would add new risk and complication to fielding the next generation of systems to the Army. Look at what FCS was intended to do – that is, to achieve as much commonality as possible across platforms so that we have a common logistics tail, common sets of components which reduces production costs, and also (and I think the biggest thing) to ensure interoperability in software and subsystems cutting across those various platforms. What we’ve had in the past are things like the Abrams [tank] and the Bradley [fighting vehicle], where we spent a lot of time and effort in the “digitization” period in late ‘90s figuring out how to kluge together capabilities to make those platforms talk to one another. FCS, it’s designed in from the beginning that these systems will talk to one another and collaborate, because they share a common operating environment, common communications environments and common interfaces. We ensure from the beginning that all these platforms share the capabilities we want them to and can work together as a team, both manned and unmanned systems. 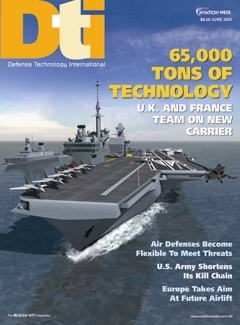 Read the whole interview in the new issue of Defense Technology International. The Defense Advanced Research Projects Agency is issuing a call to arms to scientists across the country. The target: deadly pathogens, particularly RNA viruses such as SARS and influenza that mutate so quickly, thus, regularly frustrating our immune systems and feeble vaccine attempts. Some viruses are also dramatically altered by recombination during reproduction. The March 16 "Controlling Pathogen Evolution" workshop will be hosted in Arlington, Va., to explore how computational models can be used to predict how individual pathogens evolve. Darpa officials believe it is possible to force pathogens into an "evolutionary trap" to prevent mutation into deadly strains. Darpa is recruiting experts in infectious disease, epitope prediction, vaccinology, mathematical modeling, protein structure, pathogen evolution, drug design and animal modeling. Epitopes are sites on a pathogen's genetic sequencing that are recognizable to the immune system. Pathogen evolution research has been growing in recent years due to fears of bioterrorism following the 2001 anthrax attacks as well as the success of genome sequencing in human and non-human organisms. Scientists have a long list of questions about pathogen evolution, including how pathogens jump from one species to another as in the case in SARS and avian flu, how they escape primary and secondary immune responses, and how to develop vaccines that eliminate the advantages gained by pathogens during mutation. The list of attendees who have registered so far includes CalTech, Biological Mimetics Inc., La Jolla Institute for Allergy & Immunology, Luna Innovations, Midwest Research Institute, Stanford University, and the law firm McKenna, Long & Aldridge. GAO recommended that the Air Force change the proposal request, “reopen discussions with offerors, and then request revised proposals. If the evaluation of revised proposals results in a determination that Boeing’s proposal no longer represents the best value to the government, the agency should terminate its contract,” said a public GAO document. The decision also recommends that Sikorsky and Lockheed be reimbursed by the Pentagon for the cost of filing the protest. Trading up to a bigger bird has drawbacks, says one member of the Air Force rescue community. Due to its size, the HH-47 is "a tailor-made [Rocket-Propelled Grenade] target," says the airman, who requested anonymity since he is not authorized to speak to the press. "It's big and can't maneuver quickly, making it easier to hit by the skilled RPG gunners we face in Afghanistan and Iraq. The smaller, more maneuverable aircraft ... are better able to defensively maneuver to complicate the targeting efforts of our enemies. If you scour the news reports of helicopter shoot-downs in Iraq and Afghanistan, you'll see that most were caused by small arms or RPGs or both -- and many of those were -47s, including the famous SEAL incident last summer. The -47 is also louder, which gives those gunners more warning that we're coming." Chinooks in Iraq usually operate only at night after one Chinook was shot down in broad daylight in 2003, killing 15 soldiers. Another 17 people were killed in the June 2005 downing of a Chinook in Afghanistan -- the "SEAL incident" the airman refers to. "Since it is so big, [the HH-47] can't fit into nearly as many [Landing Zones] as the -60, -92 or -101," the airman continues. "What this means is that the helo will have to hover and use the hoist or some other means to extract the isolated person. A helicopter in hover is the most vulnerable any aircraft can be, so it's no surprise that crews ... prefer to land, but the -47 will limit their options in this regard. Alternatively, the survivors would have to evade to a large LZ, placing them at greater risk of being captured or killed." The Bush administration apparently has no way of knowing whether potential terrorists have left the United States, Wired News reports. During a recent hearing of the House Appropriations homeland security subcommittee, lawmakers said they've had it with the Department of Homeland Security and it's lack of planning for U.S.-VISIT, the biometrics and facial identification screening program designed to track all visitors to the country. Unfortunately, the program doesn't track people on the way out of the country. The program requires fingerprints and facial screening for all visitors at U.S. airports, seaports and landborder checkpoints. According to the General Accountability Office, the program's cost are rapidly spiraling with costs totaling $2 billion, including $462 million requested in fiscal year 2008. 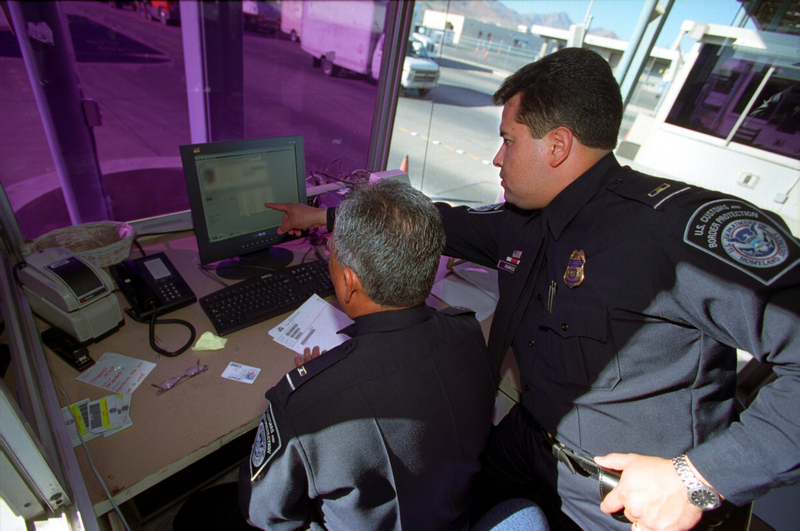 U.S.-VISIT takes a digital photograph and two fingerprints from every non-U.S. citizen entering the United States and scans that information against government watchlists and databases. Randy Hite, who wrote the GAO report, told Wired News that the program is like a plane flying aimlessly on autopilot with no destination. Congress has been waiting since 2005 for DHS to submit a strategic plan for U.S.-Visit that clearly details its mission. DHS says the GAO report contains outdated information from six months ago. Just a short introduction to say hello. I'll be blogging here through March. I'm looking forward to the wild openness of the blogosphere where words like astronut and deepglider all have their place. I just have to thank NASA for giving me the gift of crazy astronaut countermeasures to start off with, which I've linked to above. Seems the plan for dealing with astronaut's who have lost their minds in space is for crewmates to tie the crazy one down with duct tape and bungee cords, and subdue him or her with tranquilizers. CNN adds as a special note that under no circumstances may crewmates shoot because that could pierce the spaceship and kill everyone. Didn't Capt. Kirk have a sidearm he could use onboard? Anyway, I am a contributing editor at Defense Technology International, where I'm responsible for the Cutting Edge column -- a sort of technology review of the best and worst ideas in military research and development. I can't take laser weapons home with me to test out -- although that would be exciting -- so it's not a traditional technology review, but more of an analysis of where programs stand, and why they are or are not working. I'm a freelance writer based in San Diego and spent five years in Washington, D.C., as an associate editor, and then managing editor of Inside the Pentagon. Northrop Grumman is developing a “biometric” intelligence system to help U.S. troops keep tabs on suspected terrorists and insurgents. 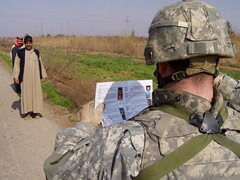 The system, which identifies people by their fingerprints, iris patterns or other biological metrics, is meant to meet a need identified by U.S. forces in Iraq. On February 5, 2006, soldiers from the Colorado-based 4th Infantry Division, deployed to north-central Iraq since the previous fall, sortied from their base to set up checkpoints outside the town of Balad. The town was so bad that the Iraqi army had sent one of its crack Kurdish units, normally based in the peaceful north of the country, into an outpost downtown. But snipers had kept the Kurdish troops from even leaving the base. Balad was desperately in need of some spring cleaning. But standing at their checkpoint on a road outside Balad, the soldiers realized they lacked the necessary tools. Army intelligence had provided them with a list including names, descriptions and in some cases outdated photos of known bad guys. The soldiers carried fuzzy color copies of the list in their pockets and compared every passerby to the descriptions. But the photos too grainy and the descriptions too vague: pretty much every Iraqi man has a moustache, black hair and brown eyes. As for names? Besides sharing a small number of popular surnames, Iraqis have a habit of tacking their father’s and grandfather’s name onto their own or even going by nicknames that don’t match their photo IDs at all, assuming they even have photo IDs. There was just no way for the American soldiers to reliably know if they had happened to ensnare a bad guy in their net. And on that February afternoon, they returned to base empty-handed and frustrated. Stinging from failures like those in Balad last year, in January the Army gave Los Angeles-based defense firm Northrop Grumman $20 million to develop a biometric solution. Soldiers might register detainees’ biometrics using a portable scanner. That info, combined with a brief history of the suspect, would be fed into a central database back in the States and analyzed by algorithms endlessly searching for connections between suspects. If, during a future operation, the soldiers happen across any of the same suspects as before, the system would alert them. Over time, the system might accumulate enough data on suspects’ movements to begin drawing conclusions about behavior patterns, allowing intelligence agents to predict suspects’ activities and, if necessary, thwart them. In Afghanistan Feb. 20, an Air Force B-1B Lancer provided close-air support for International Security Assistance Force, or ISAF, troops surrounded by enemy forces and vehicles preparing for an ambush near Kajaki. 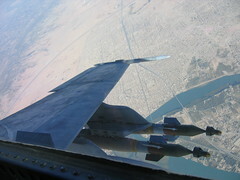 The joint terminal attack controller, or JTAC, gave coordinates to the enemy locations and the B-1 dropped GBU-31 bombs and GBU-38 Joint Direct Attack munitions on the enemy locations, successfully hitting all targets according to the JTAC report.An Air Force B-1B was then assigned to drop GBU-38s and GBU-31s on an enemy communications compound near Kajaki. All weapons were successfully dropped within parameters according to the JTAC. Now read that again: "enemy forces and vehicles," "an enemy communications compound." Vehicles and comms are hallmarks of industrial armies, the kinds of armies we're really really good at killing. It's when the bad guys don't have heavy equipment and static infrastructure that they're so hard to find and attack. When they start acting and looking like us, they play by our rules ... and we call in supersonic B-1s hauling 2,000-pound bombs. On one hand, it's disturbing that the Taliban has re-appeared in such strength. On the other hand, that kind of strength ironically means they're easier to destroy. The air campaigns in Iraq and Afghanistan have gone largely unreported. Our airpower is a major reason why our casualties aren't higher, especially in places where massive firepower can be be brought to bear without killing a lot of civilians. Places like western Iraq and southern Afghanistan. Elsewhere, coalition jets try to scare off insurgents with low-level flybys before risking live munitions.